When we introduced you to the Well Tempered Amadeus turntable - it sounded so good that I had no problems in changing from my beloved Linn LP12 turntable. There hasn't been a day since then that I've ever felt it wasn't one of the best changes I've ever made. The Well Tempered was, in Linn's own words, simply better. Unarguably superior in every way - better sounding, more detailed, pitch accurate, better isolated, easier to use, compatible with more varied systems and cartridges and a fraction of the price of the full blown Linn. In fact the Amadeus costs less than Linn's lowest spec, entry level turntable. That said, it's still not everyone’s idea of entry level. And when you hear at just how good a sound you can enjoy from turntables such as the ProJects with models well under NZ$1000, it's clear that there is a place for an option in between these two numbers. Looking at the Amadeus, it seems so simple and so elegant that it wouldn't be possible to reduce it further. But that would be to underestimate the ingenuity of the designers. Enter the new Well Tempered Simplex. Rather than explain all the Well Tempered principles from scratch, I’m going to assume you have done your homework and have looked at the Amadeus and its associated reviews . The Simplex distills the elements even further. The trademark golf ball is now literally skewered by the thin tonearm tube and sits in the familiar sticky silicon fluid bath, suspended by only a thin thread of mono-filament. The platter and plinth have been shrunk in the wash and are now only as big as they absolutely need to be. The on switch has migrated to the back panel, the arm rest and arm support column slimmed down. The plinth is now single layer using squash balls as feet, and the unique bearing has been further refined. Nip and tuck, nip and tuck. But while plastic surgery is all about cosmetics, the results run considerably deeper. 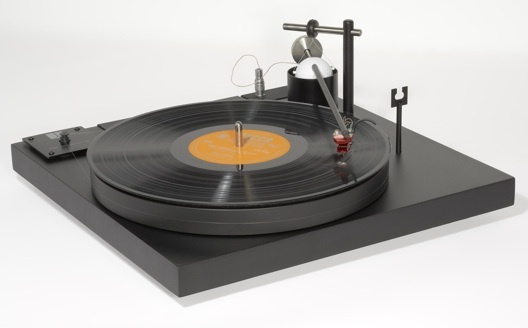 I don't know if I'm brave enough to do a straight line comparison between my own Amadeus GT and the Simplex, but I can tell you that there is no other turntable of any breed under NZ$3000 (and a great number at substantially more than that) that is going to come close to the Simplex when it comes to playing records. Within 20 minutes of first setting it up in the shop it was singing. I'd suggest that the reduction in physical size and mass has greatly reduced resonance - allowing the bevy of dampening strategies to perform to an even higher standard. If you haven't actually seen or heard a Well Tempered turntable in action, you could be forgiven for questioning how it could actually work at all. For many aspects of its design fly against the conventional accumulated logic of how turntables should be - over engineered to ever shrinking tolerances, unyieldingly rigid, spiked, massive and costly. With setup being a black art restricted to the anointed. But once you take a little time to understand the thinking behind the design, then look at the elegant and economic implementation combined with a few aspects of straight rat-cunning you'll be on the road to conversion. But all this takes a back seat to the sound quality. The Well Tempered Simplex makes records sound better than new - no matter how well you think you know a recording, we guarantee the Simplex will reveal layers you have never heard before. The background noise, pops and clicks you have lived with fade into the distance. All the audio boxes are ticked - sound-staging, dynamics, solid bass, sparkling treble and more. The isolation from audio feedback and tracking ability due to the unique damping schemes are exceptional. And the tone arm design offers almost universal compatibility with phono cartridges, while being fantastically easy to set up. Wanting not to confuse issues, we have first set up the entry level Ortofon 2M Red cartridge at on the Simplex. This makes what we are hearing all the more astonishing - it would be very easy to spend more on a complete turntable by choosing a cheaper model but splashing out on the cartridge. But as we learned many years ago, its the platform that the cartridge sits in that really makes the difference. So while the Simplex has the potential to sound stellar with a costly cartridge, it will wring every possible ounce of performance out of much more prosaic devices - saving you a considerable amount not just up front but also when it comes to stylus replacement time. And given he fact that you’ll be playing many more albums with the Simplex, this is a good thing. The Simplex makes a virtue of parsimony. It sounds so good that any ancillaries connected to it will perform above their cost - While it is a NZ$000 turntable, the fact that you'll be getting such a wealth of information out of it, that a modest amplifier and speakers will deliver and end sound quality that will far exceed any other similarly priced combination, no matter how you alter the proportions. The Well Tempered has a distinct left field appeal - it revels in its differences and you really do have to read the manual. You get to choose the cartridge and interconnecting leads you want to use on it and it has a vast scope for fine tuning - while we can do the usuals like arm height adjustment, the permutations of damping via the golf ball and silicon bath are infinite. That said, once set, the performance is completely stable. You will have to move the fine filament 'belt' between grooves on the drive pulley for speed change and endure a certain amount of raised eyebrows at the while golf ball. But if you can deal with these things, there will be a lifetime of musical rewards. Ultimately, it's the Well Tempered Simplex which we think will deliver the best musical performance of any turntable in this price territory. Whichever model of Well Tempered holds the most appeal for you, we can assure you that you'll enjoy it for many years to come. We contend that the analogue record is still the best quality musical source. And with the advent of such high quality and affordable turntable options, it's possible for almost anyone to experience sound quality that would have been the preserve of obsessive audiophiles.